A pistol on a table. While lawmakers in Washington maintain the status quo, failing to take action on even modest gun control measures this week, the governor of Hawaii on Thursday signed into law a trio of bills aimed at better protecting island residents from gun violence. Most notable is SB 2954, now Act 108, which authorizes county police departments to enroll gun owners into a federal criminal monitoring database, known as "Rap Back." Gov. David Ige's signature means Hawaii becomes the first U.S. state to enroll gun owners in the FBI system. 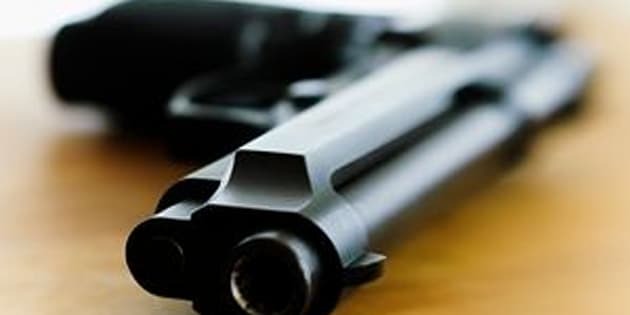 In addition to alerting authorities when a Hawaii gun owner is arrested for a criminal offense anywhere in the country, the measure will allow Hawaii police to evaluate whether the firearm owner can continue to possess and own weapons. Ige said in a statement that the law will help law enforcement better protect Hawaii residents and visitors. “This is about our community’s safety and responsible gun ownership," Ige said. "This bill has undergone a rigorous legal review process by our Attorney General’s office and we have determined that it is our responsibility to approve this measure for the sake of our children and families." Hawaii Gov. David Ige signed a trio of gun bills into law Thursday aimed at better protecting Hawaii residents from gun violence. As Honolulu Civil Beat reports, SB 2954 was introduced by Democratic Hawaii Sen. Will Espero, who urged Hawaii to be a model for other states. Predictably, the bill drew fire from gun enthusiasts, including the Hawaii Rifle Association, which said it would subject law-abiding citizens to unnecessary monitoring. "The exercise of an individual’s Second Amendment rights is not inherently suspicious and should not require a person to surrender other civil liberties, including unwarranted invasions of privacy or unequal treatment under the law," the Institute for Legislative Action, the lobbying arm of the National Rifle Association, wrote in an online call to action. "The lawful acquisition, possession, carrying, or use of a firearm does not justify subjecting citizens to ongoing monitoring." Ige also signed into law HB 625 and HB 2632. The first, according to the governor's office, specifies harassment by stalking and sexual harassment as crimes of violence that disqualify a person from owning or possessing a firearm. The second requires gun owners to surrender firearms if they have been diagnosed with significant behavioral, emotional or mental disorder. Hawaii, which already has some of the nation's strictest gun laws, has the lowest gun death rate of any state in the country, according to the most recent data from the Violence Policy Center.